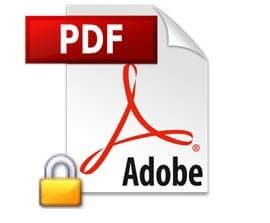 You can protect sensitive and private information in a PDF by password-protecting the file. When you password-protect a PDF, it encrypts the contents of the file so it can’t be read by any program without entering the password first. Here’s how to do it. PDF (portable document format) files are meant to be shared quickly and easily via email and the web. But the downside of this convenience is that they can easily proliferate beyond their intended audience. To mitigate this risk, you can add password protection to your PDFs. When you encrypt PDFs, passwords are required to view their contents. 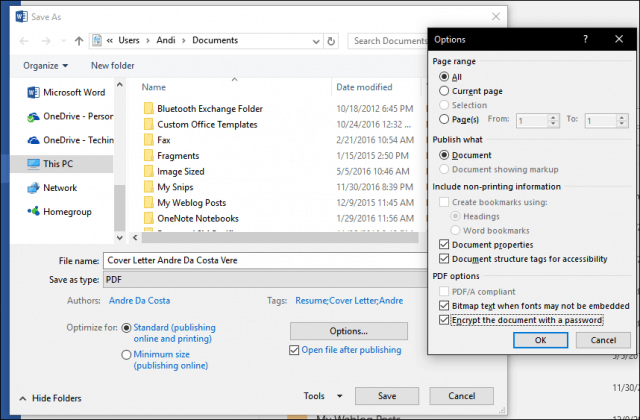 This is similar to our previous tutorial on how to protect Microsoft Office files, but it applies to PDFs. 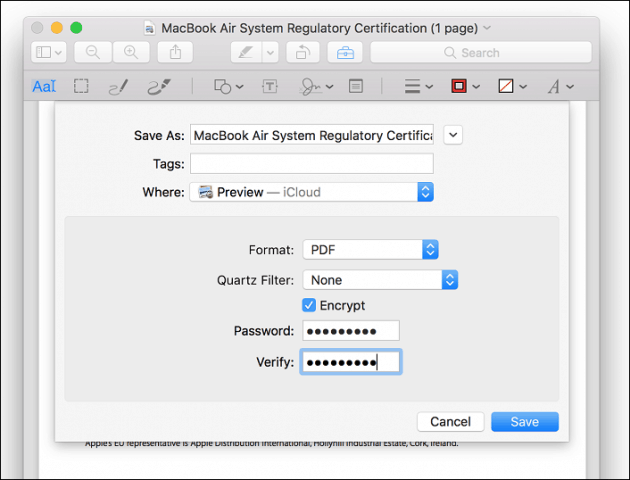 PDFs can be viewed natively in both Windows and macOS, but depending on the software you have, you’ll need to take some extra steps to password-protect PDFs. When you encrypt and password protect a document you created using a Microsoft Office program (e.g. 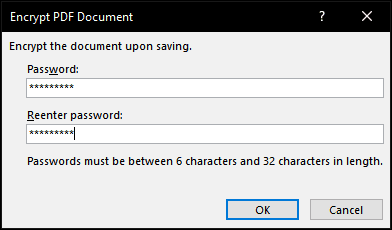 Excel, Word, PowerPoint), you can save it as a PDF that is also password protected. Open your Microsoft Office file in the respective application. Click in the Save as type list box then select PDF. Click the Options button, then check the option Encrypt the document with a password. Enter your password then confirm it. Choose a password you don’t normally use if you plan to share the document with others. That’s it! When you open the document in your PDF viewer, you will be prompted to enter a password. If you don’t have Microsoft Office installed, you can use this method with the Office 365 free trial as well. If the document you want to password protect is already a PDF, then you can use Adobe Acrobat to add a password. If you haven’t purchased a license for Adobe Acrobat, you can download a 30-day trial of Adobe Acrobat. 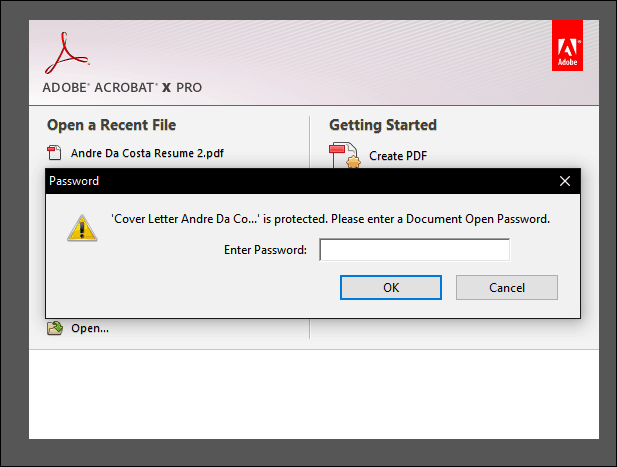 Launch Adobe Acrobat and open the PDF you would like to password protect. Click File > Properties then select the Security tab. Click in the Security Method list box then choose Password Security. Choose the level of compatibility you want. Depending on the version, you can enable support as far back as Adobe Acrobat 3.0. If the user you are sending your PDF to doesn’t have a compatible version of Adobe, they won’t be able to decrypt it and open it. Check the Require a password to open document then enter your password. Adobe Acrobat will give you an indication of how secure your password is. You can also restrict editing with a password if you so choose. If you own a Mac, you can password protect documents natively in macOS. Open your PDF file in the Preview app by double-clicking it. Check the Encrypt box then enter your password and verify it. 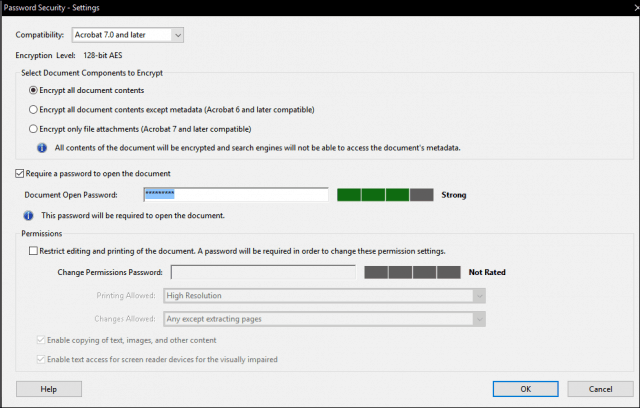 And there you have it: three ways to password-protect a PDF file. Password-protected PDF files are encrypted, which means there’s no way to “bypass” the PDF to see the contents. The PDF must be decrypted to be viewed. This is a standard built-in to the PDF format, and it works the same regardless of what program created the PDF and what program is being used to view the PDF. One last reminder: make sure you choose a strong password that can’t be guessed or cracked. Check out our article on how to create a strong password for details on how to do just that.